You or your honey decided to go with a wrapped bouquet instead of a vased arrangement. Great! Now what? 1. Unwrap the flowers and take all rubber bands and plastic bags off the flowers. 3. 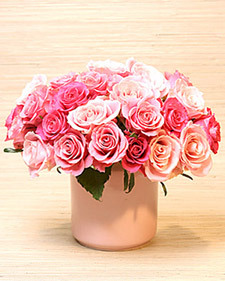 Fill a clean vase with warm water and the package of flower food provided. *Vase not clean? Use one part vinegar to three parts hot water and sit. This will break down the calcium build up and bacteria in the vase. *Didn't get a package of flower food? Use 1 tsp sugar and a few drops of bleach to a quart of water. The sugar will act as the 'food' and the bleach will clean the water. 4. 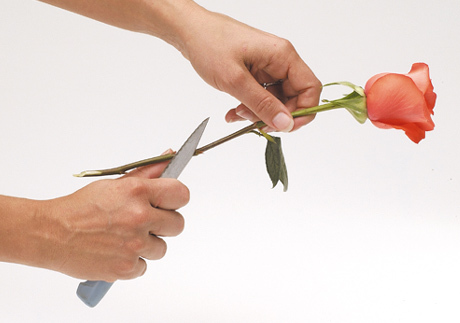 Use a Sharp non serrated knife to cut the flowers at an 45 degree angle. Cut about 1/4 inch off the end of the flower or enough so the end looks moist. 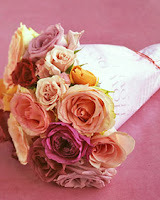 You have about 15 seconds to put the flower into water without having to recut before the flower air locks.